Moreh Nevuchim: The Not-So-Promised Land: What's That Beanie For? Walking around Meah Shearim yesterday presented me with an obvious mode of identification, both in Israel and the Jewish world at large: head coverings. Though initially and primarily worn as a sign of reverence for G-d, and to remind the wearer that there is something greater above him, it has taken on many more meanings. For men who are religious, the type of yarmulke (kippah, whatever you prefer) they wears says alot about their religious and political ideas. First, perhaps the most common yarmulke is the kippa srugah (knitted kippa). This one is worn by the Modern Orthodox types in America, and by the "dati leumi" (national religious) types in Israel. The wearers of the kippa srugah identify themselves as religious observant, but very much a part of the average American (or Israeli, British, Canadian, etc.) society. They are also almost always 100% supportive of Zionism, from both a religious and political perspective. Especially in Israel, the kippa srugah symbolizes the placement of the medina (state) above religious duty. These people tend to allow Zionism to take the place of real Torah, and often find themselves trying to justify their world outlook from a religious vision that many, if not most, say cannot be justified. These men almost universally do not wear a hat in addition to their yarmulke. The second most common style is the black velvet yarmulke. The black velvet yarmulke is almost only worn by ultra-Orthodox men. The black velvet yarmulke not only stands as a symbol that religion and Jewish culture take priority over the general society in which the wearer lives, but also shows a bewildered approach to Zionism at the least, with many more being virtually completely opposed to the secular regime in Israel, seeing Zionism as an attempt to uproot and replace Judaism, and as out of line with the edicts of Jewish religious law. 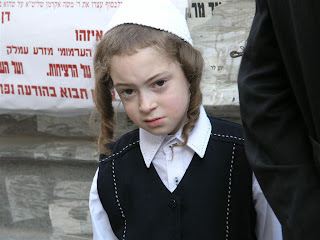 The wearer may be Chasidic, Litvish (European non-Chasidic ultra-Orthodox), or ultra-Orthodox Sephardic. A third type of yarmulke is that worn by Yerushalmis. 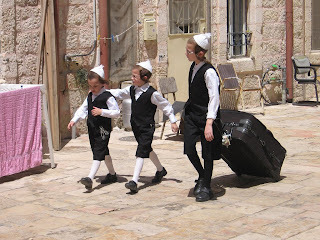 Yerushalmis are ultra-Orthodox European Jews, both Chasidic and non-Chasidic, who arrived in Yerushalayim (Jerusalem) more than 100 years ago. There are those who wear this yarmulke only on Shabbos and holidays (many non-Chasidic Yerushalmis do this, as well as quasi-Yerushalmi Chasidim, like some Jerusalem-based Bostoners), or it can be worn all the time. Those who wear this yarmulke are completely removed from the secular society of Israel. 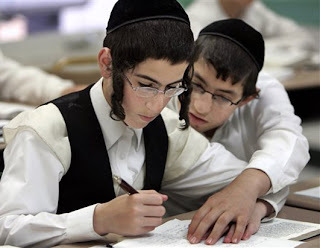 Their language of preference is Yiddish, and Hebrew is only spoken if absolutely needed. They hold non-ultra-Orthodox Jews in contempt, and are wary of their presence in their neighborhoods. While walking through Meah Shearim and other areas where Yerushalmis live, one can find grafitti on the walls saying things like "Palestine (meaning all of modern Israel) for the Arabs".